When painting from a photograph, you will need to crop your photograph before you begin to paint. This is something like doing thumbnail sketches before you paint. You are working out compositional possibilities. Every photograph contains within it any number of possible compositions – it is up to you to find the ones that appeal to you most. I hear your question already – why can't you just paint from the photo as it is? Why go through a whole process of cropping what you've got? First, the proportions of a photograph are different from those of most standard canvas and paper sizes. Consider: what size and shape do you want your painting surface to be? The proportions of an 18"x24" canvas are different from those of a 20"x24" canvas, in significant ways. What are the proportions of your painting surface? Do you want to work on a square shape? Maybe you want to work with a vertical format, and your photo is in a horizontal format. Cropping will allow you to discover new compositional possibilities hidden within the photograph in front of you. Second, an uncropped photograph will give you too much information. It's too much to ask of your brain to continually refer to the photo and ignore portions of its visual information; it's much simpler to just make sure those portions aren't there to distract you. Finally, using a photograph as is ties you to what the camera predetermines. An artist needs to allow room for creativity and imagination, for experimentation and play. You don't want to be a slave to the photograph – do you? Now you can play with the possibilities. If you are cropping your photograph digitally, your experimentation will all be on the computer. You can try various croppings, save them, and come back to and compare them all later. Then you can print the ones you like best to use as photographic references. I print mine on full-size photographic paper, and put them in page protectors, so I don't get paint on them. If you have photographs already printed, first protect them. 4"x6" photographs fit nicely inside little plastic sandwich bags, which are clear and don't obstruct your vision. 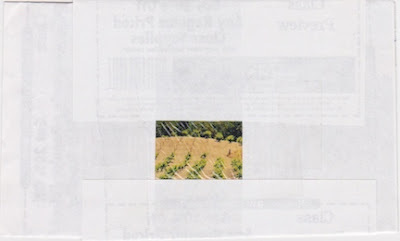 Then take pieces of paper – I cut wide, straight strips out of copy paper or whatever else I have to hand – and use them to frame different compositional possibilities. How many different, interesting compositions can you find? This is the part that is like creating thumbnail sketches. It may be possible to get several interesting paintings out of one photograph. In these two examples, the composition I chose was a very small part of the larger photograph. Sometimes you may want to leave much more of the original photo. Once I figure out which composition appeals to me most, I tape the strips of paper down around it, so that I will not be distracted by the rest of the photograph. Then I get my painting surface ready. I can either choose my composition first, and then use a surface that matches its proportions, or I can determine what painting surface I want to use first, and find compositions that match its proportions. Photo ready? Painting surface ready? Paints? Brushes? Water and medium? Hallelujah – now you can paint! Photographs are a wonderful resource for painters. They allow you to capture a moment in time, which you can work from without concern for changing light and weather conditions. You can paint from photos of people without needing them to sit without moving for extended periods of time. And you can work from photos you have taken years earlier, from your own archives – a precious resource for painters. It should go without saying – but I'm going to say it anyway – that you should ONLY work from your own photos, the photographs of someone who has given you permission to use their photographs, old family photographs, or vintage photographs old enough that copyrights have expired. • The camera's lens can alter depth perception; you may want to use those alterations in your painting. You may not; notice them, so you can choose. • The photograph gives you a composition, in a format that is wider than the proportions of most standard canvas sizes. What size is your painting surface? What are its proportions? You will want to crop the composition of your photograph to similar proportions. • Your eye sees more variations in color than you will see on a printed photograph. The colors of the printed photo will vary, depending on what kind of process was used to print it, and what kind of paper it was printed on. If you are printing them yourself, know that standard copy paper absorbs and dulls inkjet printer inks; you will get better results printing on photo paper or brochure paper. The best uses for photographs in painting are when the photograph is simply a resource – a springboard for you to take off from. It can give you useful information about composition and light, but don't let what it shows you constrain you. It is a helpful place to begin; then the question is, where will you go from there? 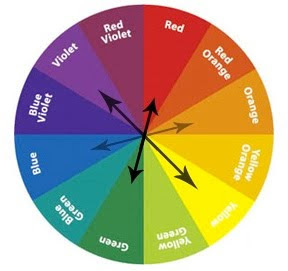 Colors opposite each other on the color wheel are called complementary colors (not because they compliment each other). When you mix complementary colors, they make neutrals (browns and grays). And when you put them side by side in a painting, they create color contrast that draws our eyes. The mixing palette, or printer's palette, used by professional printers as well as your inkjet printer, has different primary colors, and mixes differently. The yellow is a little lighter, the red is not red but magenta, and the blue is the warm and turquoisey cyan. Here, yellow and cyan still mix to make green. Cyan and magenta make purple. 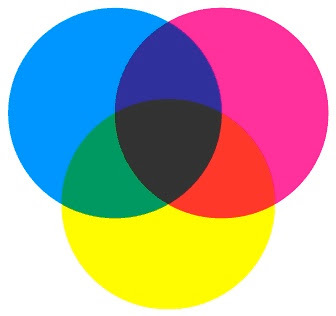 But to get a true red, you mix yellow and magenta. To get orange, you use a little more yellow and a little less magenta. And notice how they all mix together to approximate black? Here are two very different portraits, by Rembrandt and by Modigliani, that each use the technique of scumbling. 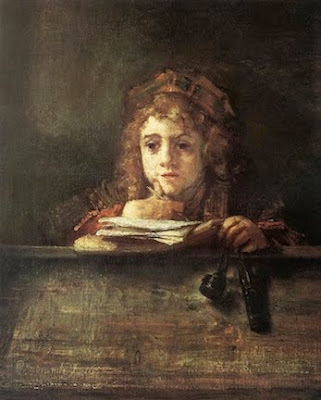 Rembrandt's is a portrait of his son, Titus. To scumble is to drag a dry brush with opaque or semi-opaque paint across another dried layer, and color, of paint, in such a way that allows you to see the color underneath. Often, as in these paintings, lighter colors are scumbled across darker ones, which creates beautiful light, drama, and texture. Scumbling allows you to transition, beautifully and subtly, between light and dark passages, or between colors. Notice how it creates an almost pearlescent appearance in Modigliani's portrait of Maud Abrantes? 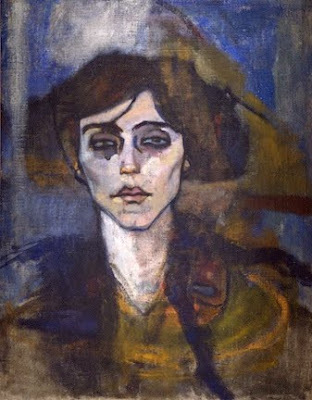 By scumbling lightly over the darker underground, Modigliani created beautiful areas of shadow, particularly on her neck. Using a thin undercoat allows you to use the texture of the canvas, as you scumble across the top, as you can see clearly in this detail. Don't limit yourself to painting light colors over dark ones – this technique is useful with any color or value combination. Here is a detail of clouds at sunset from a painting of mine. Although the colors and values are more subtle than the examples above, layers of scumbling created the hazy color transitions and feelings of light and dark in the clouds that I wanted. What's composition all about, ultimately? For painter Karen Appleton, it's finding ways of making the painting irresistible – pulling the viewer right into it. "I always want to make the strongest abstract visual statement, but before I start thinking about composition, I am already in love with the idea for the painting. The foundation of a painting for me is always an idea or feeling, and once I know this, all composition decisions are based on what will best describe what I want to say in the painting. How and where I crop an image or don't crop an image; how and where lights falls; how shadows are cast; what direction shapes are going – all these things help me express the underlying idea." "One basic approach to composition for me, though, is to keep in mind the Alfred Sisley quote I have on my blog, which is, 'Every painting shows a spot with which the artist has fallen in love.' I always looks for that one area on my model or set-up that just makes my heart beat faster. "With that spot or area in mind, I organize the image on the canvas so the spot will land on or near one of the golden sections of the canvas. 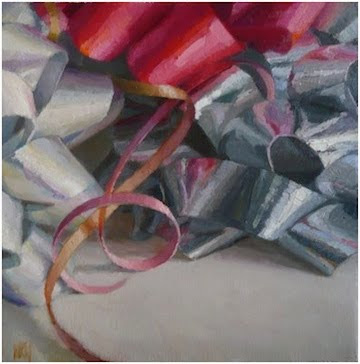 Then I check to make sure diagonals from the folds of wrapping paper, corkscrews of ribbons, cast shadows, etc., are leading the eye around and to that area. For me, this spot is always a key area in describing the feeling or idea behind the painting as well. "Ultimately my goal with composition is simple – do everything I can to reach out and pull the viewer into the painting. I want the painting to just be irresistible." Karen Appleton, whose artwork you can find online at karenappleton.blogspot.com, paints gift-wrapped presents, and the profusion of color and exuberance found in ribbons and bows. 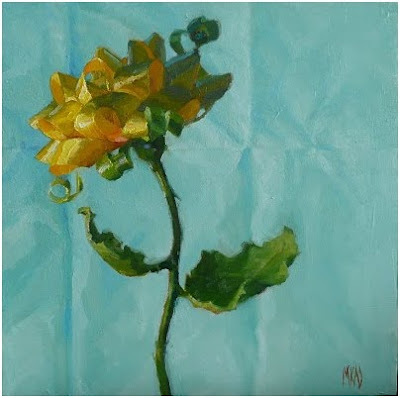 We conversed by email as I prepared to write about her work, and she shared what she loves about painting, how she approaches a painting, and how she approaches composition. "I love everything about painting," she writes. "I love the smell of the oils, the feel of a big blob of paint as it smears on the canvas, I love sketching out ideas, mixing piles of gorgeous color – everything. "But I am crazy about observation, especially observing color. I am fascinated with how our brains perceive and interpret color, especially as it wraps around form. I enjoy playing close attention to the variety of colors that actually make up what we perceive as only one. Seeing how this variety of color breaks apart into abstract shapes, or pieces like a puzzle, and how they fit together to form the object is beautiful to me, and I really enjoy playing this up in my paintings." 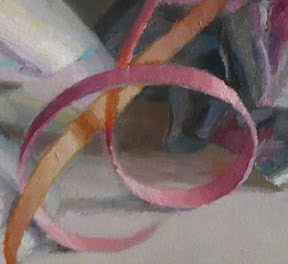 You can see how this comes into play in her painting Melt, above, and in a detail below, with its profusion of ribbons. "I also enjoy working from life – it is a very important part of my process. It requires me to slow down and focus all attention on observing an object in an environment that slightly changes throughout the day. So a painting becomes a selection of the most beautiful colors as they change from day to night, and day by day. I'm not capturing a moment in time, but many moments in time, which is exciting to me." 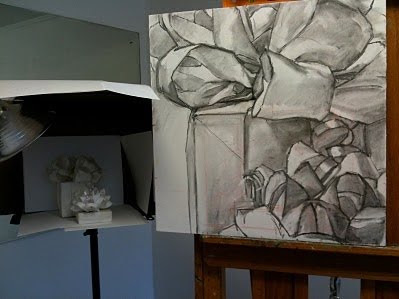 Here you can see how Karen Appleton arranges a still life setup, with the composition of a new painting drawn out in charcoal on the canvas beside it. 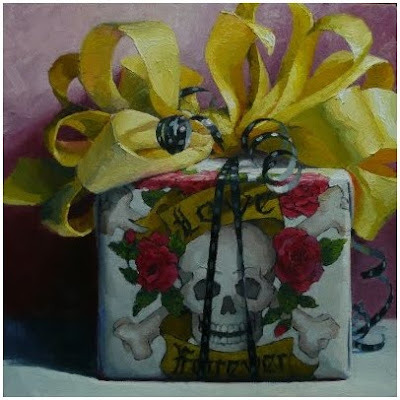 Asked about her approach to her subject matter, she wrote, " A painting always starts with an idea of feeling. Usually an idea is inspired by an experience – a jog in the snow, a crowded train, signs of spring, etc. I automatically think of these experiences in terms of color, shape, and texture. Snow might be a heavy white velvet ribbon, ice might be a shiny silver stick-on bow. With the ribbons and bows I recreate the visual experience, but I'm also attempting to describe how that visual experience felt." 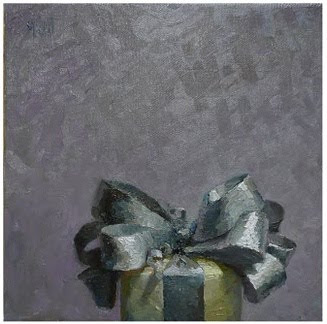 "I find that an object's shape or positioning in a composition can be very helpful in expressing a feeling. 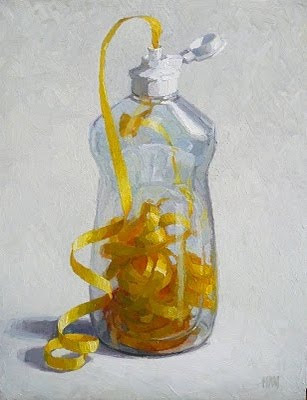 Any object can be expressive, but for me, ribbons can be shaped or arranged to reach up or out to the viewer; they can flop over, feel heavy, droop, bend, or bounce; they can pile on top of each other; they can almost touch, or completely intertwine together. "I also adore the entire process of actually creating the image I'm going to paint. I chose the colors and shapes that will contribute to the feeling of the painting. It's almost like building a little stage, picking the actors, deciding costumes and lighting, and writing the script." What happens when you're not feeling so creative? So, what happens when you're not feeling so creative? Maybe you're feeling like you aren't coming up with ideas you like; maybe you're not happy with how your work is looking. You are not alone. Every one who engages in creativity past the age of nine or ten knows what this is like. The first thing to do is stop listening to your inner critic. You know that voice – the one that says, "Oh, that isn't very good," or "I can't draw a straight line," or "That doesn't look anything like an apple." It's a short step from "that isn't very good" to "I'm not very good." And there you would be completely wrong. Your critic is not helping you, though you may think that is its purpose. Truthfully, the critical voice can kill the creative spirit. It will pick apart and destroy your creative process if you let it. It will begin to dictate what to do and not to do, it will tell you how you can and can't be creative, it will edit and censor ideas, and it will make you feel as though art isn't fun any more. So how can you handle your inner critic? When it whispers to you, tell it to go away and come back later (how much later? Maybe a couple of hours? A couple of weeks? A month or two?). Tell it to go out for coffee. Tell it it needs a good vacation in Hawaii. It's getting far too stressed out, after all, and clearly needs a good break. And if it keeps coming back, tell it that it can't come back until you're good and ready – and mean it. Then, just play. Remind yourself that art doesn't need to be serious. Just play. Remember the joy you felt when you were four years old, of just scrawling across paper with crayons? (Before some critical voice told you to stay in the lines, or to stop coloring people's faces blue or trees orange.) Can you find that joy again? 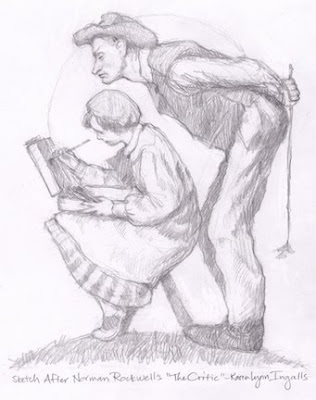 Imagine that you are four, and pick up some crayons, and scrawl –NOT to draw something you see. Just to scrawl and color, and play. Just going back to something simple – and trying something different or new – can help. You can play with blocks, doodle on paper, make collages with magazine pictures and glue sticks, or swirl paint onto paper (NOT canvas – that will feel too much like working on a painting). 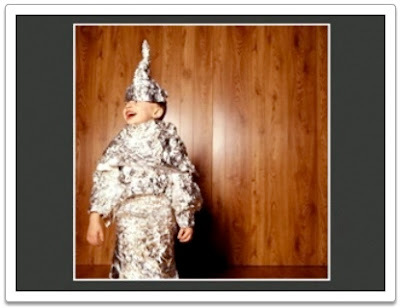 You could make a hat out of aluminum foil. Whatever you do, do it with a spirit of play and experimentation. Allowing yourself to make mistakes will help you keep the creativity flowing. There are times, though, when everyone hears the voice of the inner critic more loudly than at other times. And here are tips from many artists about how they can overcome creative blocks. So, what's this about a focal point? And what the heck is a focal point? And why does it matter? As I wrote in my 10-20-09 post, Finding Your Focal Point, "The focal point of a painting is the place where the viewer's eye wants to go. The question is, is that where you want the viewer's eye to go?" Consider this situation. 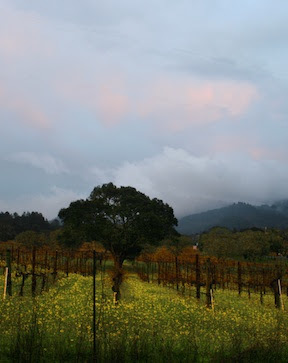 Imagine that I want to paint a vineyard with oak trees rising above the vines (not a stretch living around here, right?). Here's a thumbnail sketch of a possible composition. I want the taller, darker group of oak trees on the right of the composition to be the center of interest. But the rows of vines heading away from me in Example #1, on the left, lead to a smaller, lighter group of trees. The rows of vines create converging lines that lead my eyes to focus in another part of the painting. Uh oh.... What to do? 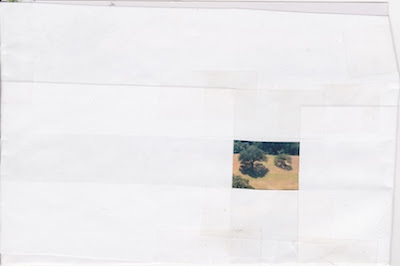 If I make sure the lines converge toward what interests me most – as I did in Example #2 – my viewers' eyes will be lead along those lines to the taller, darker group of oak trees – the focal point of my painting. Voila – it works! You can read this and ever so much more at Finding your focal point and Leading the eye to a painting's focal point. In a short two-minute YouTube video that I think you will enjoy, On Painting, painter Jerry Fresia talks a little more about how he paints. "When I look at something," Fresia says, "I do not see houses or boats or water. I see color – the colors of my palette. I see the world through those colors. 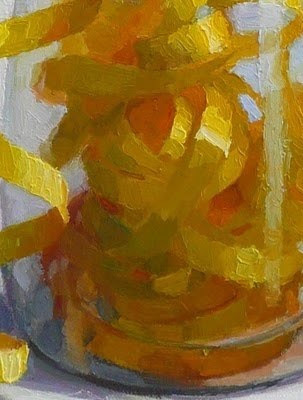 I squint to simplify, and look at relationships...."
It's a concept that can be a little difficult to understand when you are first beginning painting. 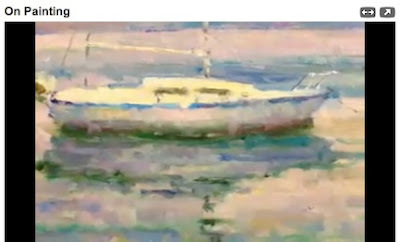 As the camera pans the surface of a painterly image of a boat, he tells us, "This is not a boat… it's purple and pink and green and blue." If this is new to you, try it out. Look at something nearby – can you see it as color and shape, instead of as a specific object? Try it a few times, looking at different things. If you're having a hard time with it, try looking at something upside down. Do you suddenly see colors you didn't notice before? This is a critical skill for a painter to develop. He is very clear about the necessity of suspending judgement as you paint. If that critical voice in your head starts talking to you, send it out for coffee – it won't help you create. As he says, "This is not about results – it's not about objects. It's about brush strokes, the human touch of paint upon canvas." Jerry Fresia's other YouTube videos are well worth looking at, too. When you view this video, you will see them listed under More From FresiaStudios. His home and studio, and their Lake Como setting, are incredibly beautiful. He teaches workshops there, too. You can find out more about him, his paintings, his studio, and his workshops at www.fresia.com.